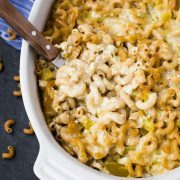 Crockpot cheesy potatoes are a classic dish for potlucks and holidays, made even easier by cooking them in the slow cooker. More room in the oven for more great food! Crockpot cheesy potatoes. Where do I even begin? I swear these have a piece of my heart. You might think I’m exaggerating, but I’m not. Am I the only one that grew up eating these at practically every holiday gathering? 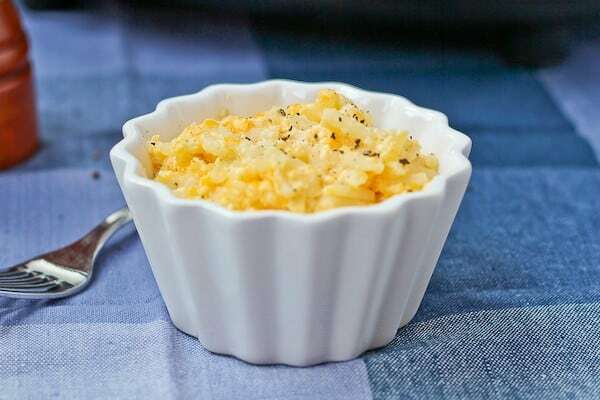 Maybe it’s a Michigan thing, but cheesy potatoes are a must at holidays – especially Easter and Christmas. On Thanksgiving you have good ol’ stuffing (dressing?) but every other holiday necessitates CHEESY POTATOES. Do I even need to mention that they’d be perfect for Mother’s Day? (Okay, well, there’s next year…) – dads, kids, whoever – make these for the moms in your life, any day of the year. She’ll love you forever. Plus they totally work for brunch just as well as for dinner. I always eat the leftovers for breakfast the next day. Who doesn’t like them? Creamy, cheesy, gooey, potatoes. Comfort food to the max. Because of their prevalence at family gatherings, they instantly bring back memories for me. Memories of family dinners with the extended family. Tables pulled together in basements with folding chairs around them. Moms, dads, siblings, cousins, aunts, uncles, grandparents. Everyone together. Sharing a meal, sharing cheesy potatoes. I’m hard pressed to think of anything that is better than that. Throw in some ham, a vegetable, some soft dinner rolls, and a family-favorite dessert, and all that’s left to add is laughter and love. Okay, that sounded really cheesy. Ha. Cheesy. Like these potatoes. Oh and I almost forgot to mention the best part! 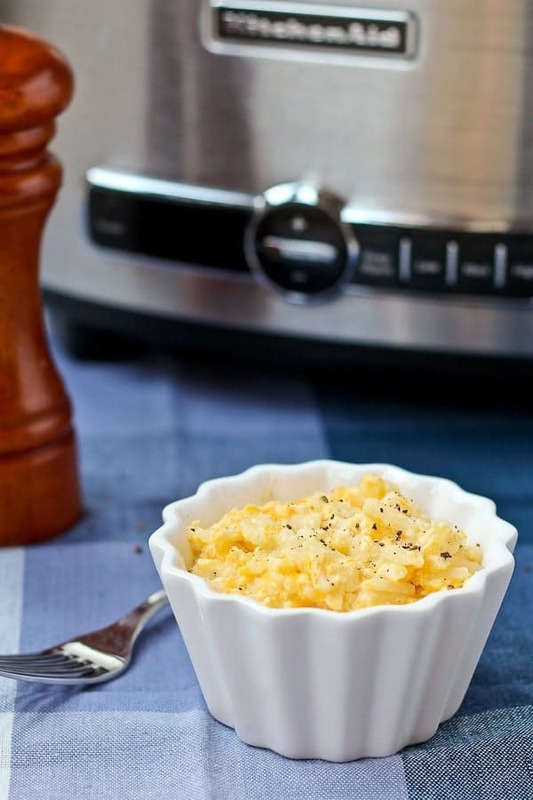 These wonderful things are made in the slow cooker! That’s right – throw it together in five minutes before church and what do ya know? They’re ready when you get home. (Just like this awesome slow cooker stuffing recipe!) Frees up that valuable oven space AND keeps them warm for serving. Pretty much an ideal situation if you ask me. Just add that laughter and love, ya know? I used hashbrowns but you could also use cubed frozen potatoes. You could also make these with real potatoes (I mean, they’re all real, but you know…not frozen) — just make sure to put them in a lint-free towel first and wring out alllll the liquid. These are great for a party! Turn down to warm when they’re done cooking to keep them warm for serving. Fun additions: bacon, sautéed onions, green onions, jalapeño, cornflakes on top, whatever you love! 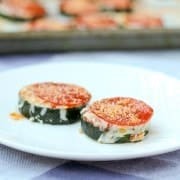 Looking for some more great dishes to round out your holiday meals? Try citrus salad with mint, honey, and lime, chocolate crepes with peanut butter marshmallow filling (!!!!! 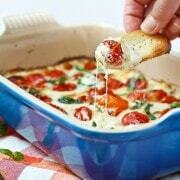 ), or baked eggs in tomatoes. 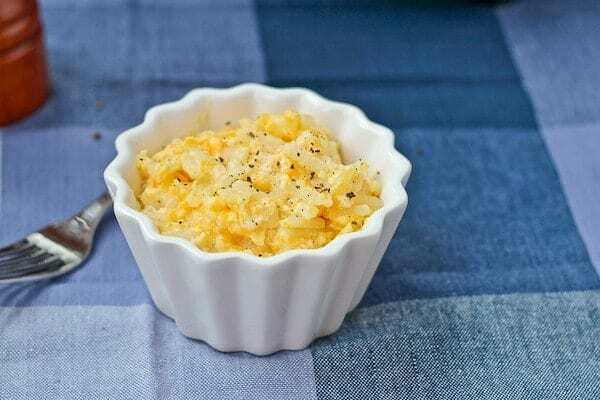 This recipe for CrockPot Cheesy Potatoes was originally developed for Food Fanatic. Mmm I think I need to start introducing these into my holiday celebrations! These look so delightful and addictive. I love that chicken soup addition for even more flavor!